UCMP News has always focused on the research, programs, and achievements of the faculty, staff, and students associated with the Museum. Our website continues to provide news briefs on Museum activities, as well as information on the organization and facilities of UCMP. However, there is a broader community that is of critical importance to UCMP. In this and ensuing issues of UCMP News, we will highlight segments of this broader community and their contributions to the UC Museum of Paleontology. Jim Parham received his Ph.D. from UC Berkeley in Integrative Biology in May 2003. His research focuses on the origins of marine turtles. As a Postdoctoral Associate, he is continuing his research on fossils from the UCMP collections. Jim describes the benefits of this position: Besides having access to my research specimens, as a postdoc I get to maintain interactions with the faculty and graduate students at the UCMP. My postdoc lasts for another 2.5 years. After that I plan to keep doing what I am doingresearching, traveling, and writing. And traveling he is. Jim just left Dubai, where he was catching lizards and is heading for Iran for further fieldwork. 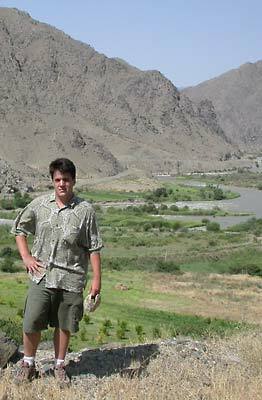 Jim Parham in Armenia on the north bank of the Arax River. Beyond the river are the mountains of northern Iran.